But really, the things I have been doing make me feel like I have not been really busy at all. One of those things that I have been doing is watching my boys learn how to surf. This is the moment they have been waiting for. Dad has finally declared them to be strong enough swimmers and good enough boogie-boarders that they can now hang ten with the Big Kahoona himself. Dad FINALLY has his surfing buddies that he has been waiting for since the birth of our first son. In all honesty, I am surprised he has been so patient over these last eight years. Of course, I suppose it should have been no surprise that both boys popped right up on their boards and are now completely hooked. They have both been begging to hit the waves now…like every other second. Here is my hotshot big guy…I wonder sometimes if he is part fish. I even told him this. He looked at me like I was crazy and simply told me he is so comfortable in the ocean because he respects it. Sheesh, Mom! 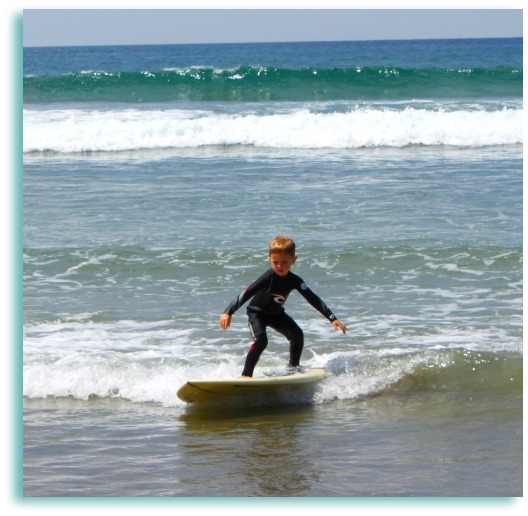 And then, of course, my newly five year old baby was not about to let his big brother show him up…he hopped on that thing and had people on the beach doing a double take to see such a little guy catching waves. So…I am having fun watching all of my boys spend their day out in the ocean on the “big boards” now. They are just growing up way too quickly. Just a couple of summers ago, I was writing about how Dad was taking our oldest out on his inaugural boogie-board ride, and how baby brother was so sad he was not yet big enough. And now look at them! Sniff. Sniff. Time is flying by too fast. Next week I will be back with my regularly scheduled programming here at Cook It Allergy Free. I have recipes, giveaways, and other fun surprises planned. I miss you all but will see you very shortly…school is about to start up again and my youngest will now be starting Kindergarten. This means I am going to have a lot of time on my hands soon. 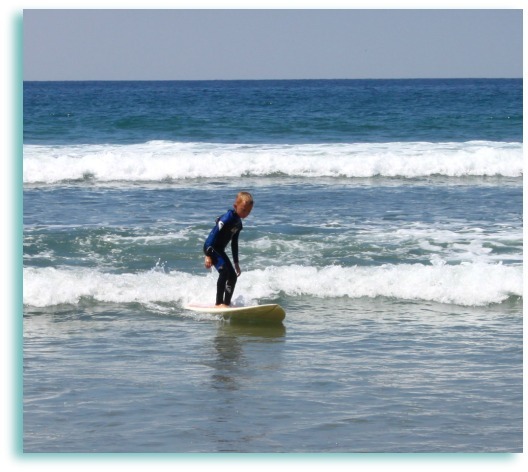 That is so great about your boys swimming and surfing….We have a vacation to Legoland scheduled, and now I am worried about how to keep my son’s Epi pen safe and dry… Also, if he is highly allergic to Shellfish, would he be able to swim in the ocean safely? Hi Pardis! Do you have a water proof pouch for the epi? My girlfriend has one for her kids and has saved her a number of times from ruining them. And as far as swimming in the ocean with a shellfish allergy, you may want to ask your doctor about that. I know several friends with shellfish allergies, however, who are in the ocean regularly without any problems!! Hope you guys have a great time in Legoland! I always thought you are supposed to raise your kids to soar and you are doing just that. This is the cutest thing I have seen all week, it made my day. Kindergarten! I’ll be thinking of you when I get my batch of kinderlings this week!! I couldn’t figure out how to leave a comment on your kitchen post. Maybe the comments are closed. BUT I have to tell you that I LOVE your kitchen!! I have serious counter envy though. I love your natural light and can just picture you working happily with your boys running in and out. Great post! What impressive little men Kim! Serious double-takes. 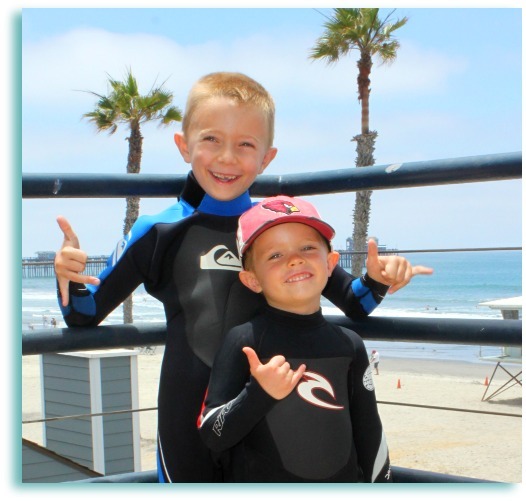 They’ve obviously got dad’s surfing talents. Good thing mom’s got the camera talent to capture the great pictures! NOOOO, they are growing up too fast! Sounds like you guys are having a great summer! That is what memories are made of. Enjoy every second of it my friend! Sadly summer is over here. We are on to the next adventure…high school and middle school!